Hi Ben – this is quite an old post & these were sold on a couple of years ago, but if I remember right, the spindle length wasn’t too crucial. I think I used a 118mm, which was officially a bit longer than specified, but seemed to do the job on the bike they were fitted to. what spindle length do you use with the triple? Now lots of time’s gone by & I’m still using these cranks it’s worth saying that Superstar ISIS BB’s seem to last me a year minimum with lots of use & a reasonable amount of drops & jumps. 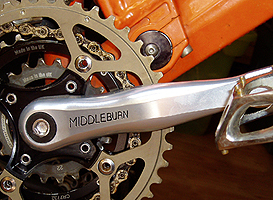 Also, Middleburn now do an external BB version of these.